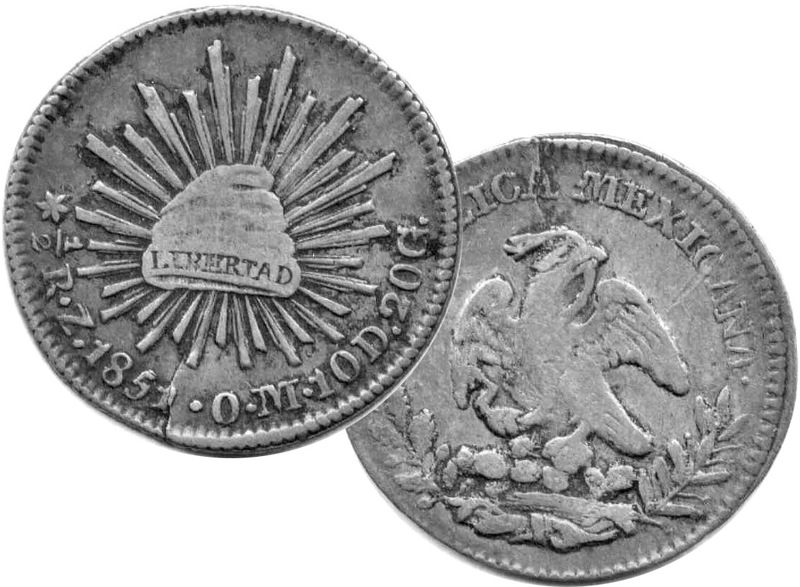 Photo: 1851 Mexican Republic 1/2 real coin from Zacatecas mint — one of several model coins for 2010 PNNA token design. Actual token images appear below. See article describing this design. 2010 C2010-01 medallion, pewter, approx. 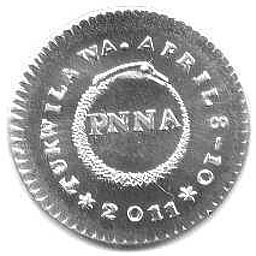 18 mm, thin planchet, 61st Annual Convention, Tukwila, Washington, April 16-18, 2010. Only available in collector sets or as presentation pieces: C2010-02 silver; C2010-03 copper. Dies prepared by Greg Franck-Weiby. Mintages: Pewter: 750 handed out to paid attendees at the door, 25 in collector sets, 100 presentation pieces, and about 100 struck at convention and sold for $1.00. Silver: 25 in collector sets. Copper: 25 in collector sets. Note: sets packaged only in flips beginning this year. 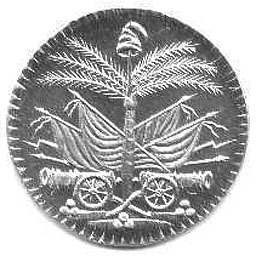 2011 C2011-01 medallion with designs based on early 1800s Haitian coinage (see type description), pewter, approx. 18 mm, thin planchet, 62nd Annual Convention, Tukwila, Washington, April 8-10, 2011. Only available in collector sets: C2011-02 silver; C2011-03 bronze. 2012 63rd Annual Convention, Tukwila, Washington, April 13-15, 2012. No souvenirs. 1989 Washington State Centennial medals - This is not a PNNA souvenir, however extra medals donated by coin dealer Gene Henry (including this medal and medals for some counties in Washington) were handed out at the 2014 Tukwila and Portland conventions, and are still being handed out. Gene found them in storage after 25 years! We regret that Gene passed away in September 2014 - see the PNNA memorial page.